Overview The marine based wilderness of Glacier Bay National Park includes ocean coastlines, glaciers, snow covered mountains, deep fjords and rocky cliffs, plus the beautiful inland freshwater rivers and lakes. This crazy beautiful place is so fantastic it is hard to take in. The sea coast has many plant species and a huge number of different marine and land based wildlife. There is a lot to see here and the opportunities for adventure abound. Be careful though this is no kiddy park. 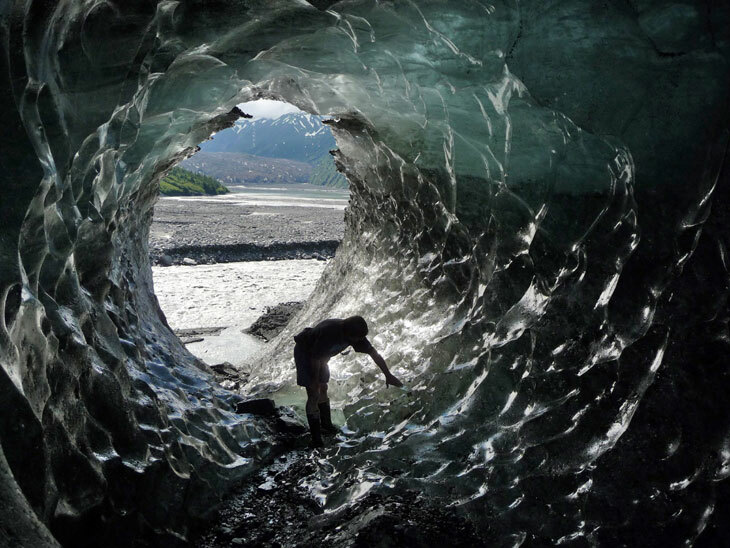 Picture above shows a person inside a glacier melt in Glacier Bay National Park Alaska. Camping First get a permit and a bear resistant food container or two by taking the orientation speech given daily at Bartlett Cove Visitor Information Station. It is free and required from May to September. 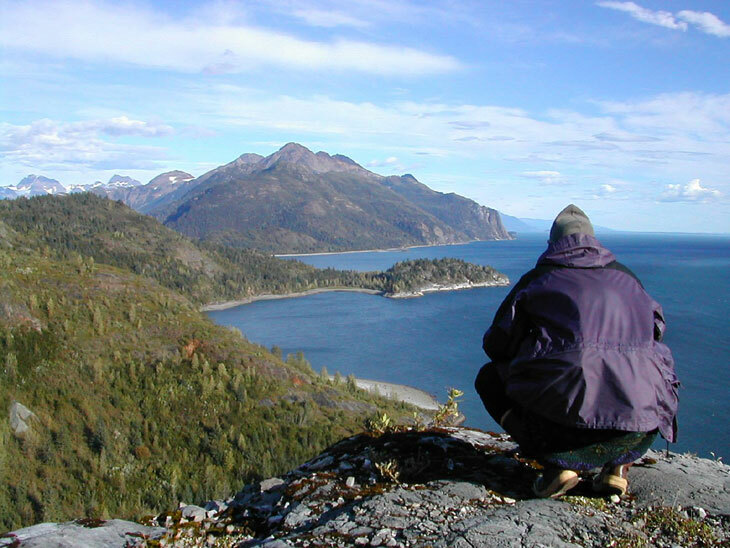 The Bartlett Cove campground also offers bear-resistant food caches, firewood, and a warming hut. You can be dropped off in the backcountry by the Parks tour boat for a small fee. You don't need a permits when outside the bay. Picture of hiker getting up close to glacier in Glacier Bay National Park & Preserve in Alaska. Camper Orientation You can't camp here unless you first take the free camper orientation class at the Visitor Information Station. I am glad here in this wild place they do this since otherwise many unwitting intrepid adventurer wannabes would get hurt. Backcountry permits must be obtained if you plan to overnight anywhere in the park..
Group camping is permitted only in the group camping area for groups of 12 people or more. You cannot camp outside the campground unless go more than a mile from Bartlett Cove. This allows for the "I am out here and nobody else is around" feel many search for. Water and garbage cans are located at the Visitor Information Station. There are three food caches to store anything with a smell from soaps to foods and medicines or even vitamins. You are not allowed to eat on the beach except between the high and low tide lines. Never leave food unprotected as bears are coming for it. Kayaking the sea can be fun and is popular here in Glacier Bay. You can take a kayak trips starting from Bartlett Cove, or if you bring your own they can take you on a boat using the camper drop-off service. Make reservations for both rental kayaks and the daily tour boat if you plan on using them. Picture shows that Alaska is not covered in snow year round. Summer months in particular have great weather most years and here views of Glacier Bay National Park and Preserve are breathtaking. Sport Fishing Glacier Bay is best known for tidewater glaciers, wildlife photography and sighting, and some seriously magnificent geology. Many sport fisherman come here as well and I have heard it can be grand. Visitors from all over the world fish here, especially the Asian countries. Glacier Bay has a big variety of different fish species in both salt and freshwater. Saltwater anglers typically target the sweet thick halibut. Some come for the elusive salmon. In the freshwater rivers and lakes anglers usually target salmon and sea trout while enjoying the solitude of the quiet wilderness. 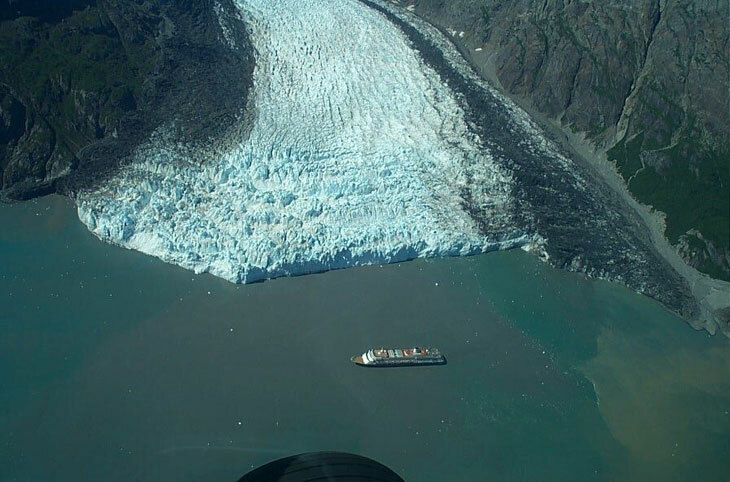 Picture showing aerial view of cruise ship in Glacier Bay. Vanabode Special Notes: Even though Alaska can be extraordinary and Vanabode offers a great way to get here cheap I still cannot recommend this destination for a Vanaboder. It is rugged and wild and the inclement weather can be disappointing in Glacier Bay National Park & Preserve Alaska.